Bacon & Puree: A puree goes very well with bacon. The smooth even texture of the puree with the crispy crunchy texture of the bacon are hard to beat. You can't go wrong by picking a vegetable. Keep it simple. Vegetables tend to be mild flavors that will contrast with the bacon. This dish will make for an attractive presentation as with the bacon and pumpkin puree (pictured). What's best, is you can can let your culinary juices flow. You make the call... Some ideas; Squash, Egg Plant, Cabbage, Potatoes, Carrots, and Pumpkin are all great as puree. Get what's in season. 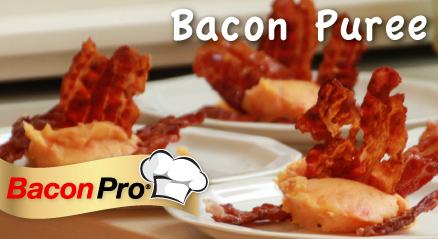 A Bacon Pro will help you cut the time it takes to cook enough crisp bacon for the bacon puree. It will save you a ton of clean-up time, so you can serve a beautiful plate of a light first course... without all of the work.